Product Details- Ingredients - 15-30% anionic tensides, less than 5% amphoteric tensides, aroma, preservative- 5-bromo-5-nitro-1.3-dioxane. Use- Ideal for dogs with brown coats, Gently cleans the coat, Reduces dry skin problems. Suitable for - Dogs with brown coats.Quantity-250 ml. 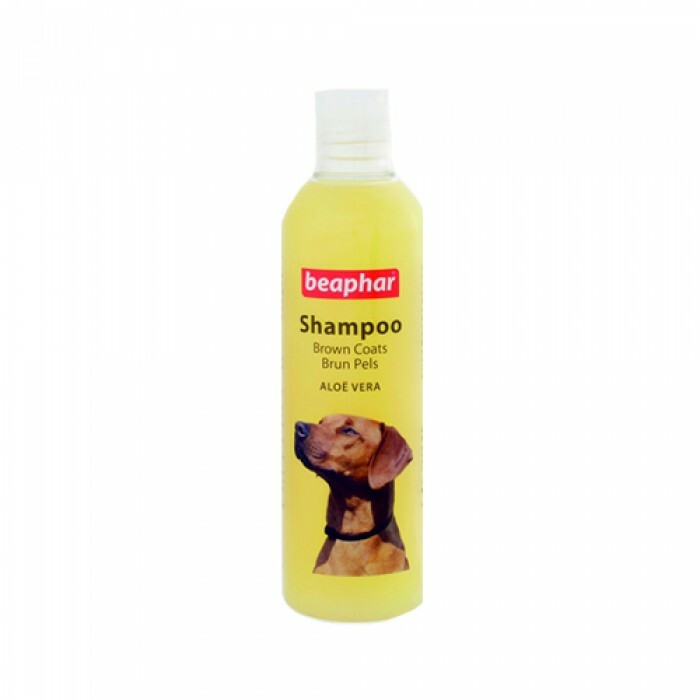 Product Information- Beaphar Shampoo for brown coats is a specially formulated, cleansing shampoo for light to dark brown coated dogs. The shampoo contains aloe vera for naturally moisturised skin. The dog will look well cared for and his coat will be tangle-free and beautifully shiny. The shampoo is pH-neutral and so is suitable for even the most sensitive skins. Wet the coat with luke warm water. Massage the shampoo into the coat until it lathers. Leave for 2-3 minutes. Rinse thoroughly. Beaphar Shampoo with Aloe Vera is a newly developed shampoo for the gentle cleansing of dogs of all breeds with white to dark brown fur (e.g. Westies, Poodles or Maltese dogs). Moisturising aloe vera cares for the skin and keeps it smooth and supple. Your dog will look well cared, for their coat will be tangle free and will acquire a natural, silky shine. The shampoo is pH neutral therefore will adapt to the most sensitive skins.